[PDF] Good news: Skype has revived voice changing function in its desktop API. This means AthTek Voice Changer for Skype will be compatible with the latest Skype versions. All the users of the voice changer will be able to upgrade Skype to the latest version. According to our test, AthTek Voice Changer for Skype is compatible with Skype v6.14 or later, and Skype v6.9 or older. If your Skype wasn’t a compatible version with Voice Changer for Skype, please upgrade it to the latest version now. Thank you for all your efforts in reviving voice changing function. Hundred of users sent their requests to Skype’s community, FaceBook and Twitter. These requests made Skype reconsidered the voice changing function in its desktop API and finally made a progress. We have already sent out hundred of free licenses to the users who send a request to Skype. Now, all the Skype related software of AthTek Software (including Skype Recorder and Voice Changer), are compatible with the latest version of Skype. 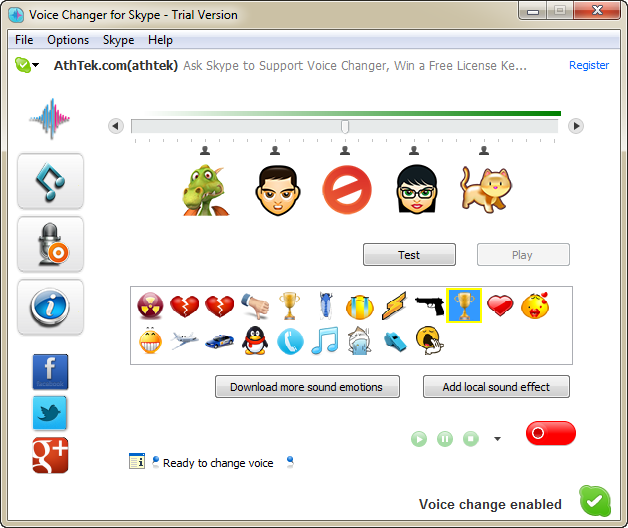 As voice changing function is revived, we will stop providing free license of AthTek Voice Changer for Skype. But you can still request a free license key by posting a short software review on your FaceBook or Twitter page. Once your software review has been successfully posted, please contact partner@athtek.com to request a free license key with your Skype ID!